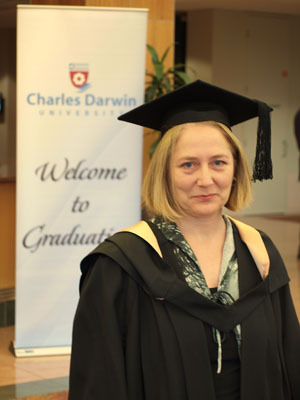 Susana Fernandez-McKeown at the Charles Darwin University mid-year graduation ceremony for Central Australia, held at the Alice Springs Convention Centre. Juggling family commitments and living in regional Australia were no barriers for Bendigo local Susana Fernandez-McKeown, who realised her teaching ambitions through the Northern Territory’s Charles Darwin University. A 12-month Graduate Diploma in Teaching and Learning has given the mother-of–two qualifications to teach her young charges at Golden Square Primary School in Bendigo. A background in adult language teaching and interpreting made her transition into the classroom relatively easy, but she struggled to find a course that offered flexibility and support. “I was nervous at first about taking a course externally, but once I became familiar with the online course guide I was very happy with it,” she said. Susana is one of more than 100 Victorians studying undergraduate and postgraduate teaching degrees through CDU. Around half these students are from regional Victoria. The university is increasingly catering to the needs of external mature age students across Australia, who choose the flexibility of on-line study and the easy accessibility of fellow students and lecturers. “I researched Victorian universities, but preferred CDU’s 12-month course that would then prepare me to teach in the primary sector,” she said. It was a leap of faith for the arts graduate, who signed up from a university located thousands of kilometres away. “I was nervous at first because I’ve never studied externally, but I found the course and lecturers very well organised and enjoyed it,” she said. The course’s strong practical focus and local placements were other drawcards for Susana. “This particular course had many placement days which was daunting at first, but it gave me the confidence to then jump into the classroom which I have done now,” she said. “You have to be very committed and have a goal and a reason for why you are doing it because much of your work is completed after hours,” she said.